Everything is a bit hot dry and parched here in Georgia right now. So we hit some garden centers this weekend and picked up some succulent style flowering plants. They hold more water in their leaves to survive and thrive in low rain conditions. These will make a pretty planter for our back patio. Our sassy concrete cottontail supervisor was on hand to check all the supplies out as they arrived. Unfortunately for the picture, the coral Purslane’s proved bashful and closed their beautiful blooms before I could snap a group shot. 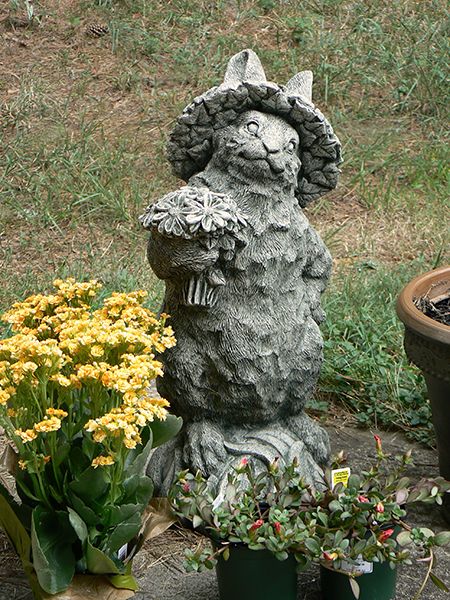 This entry was posted in Photos and tagged attitude, concrete, cottontail, garden, green, plants, postaday2011, rabbit, sassy, yellow by Rabbittude. Bookmark the permalink. My bunnies love purslane. It’s growing as a weed in my mom’s vegetable garden. I had some on a salad. I found it pretty tasty as well. For bunnies, it should be limited like spinach because of oxalates.